The racist English Defence League (EDL) are returning to Colchester on May 22nd, once again using Lee Rigby’s tragic death to fuel their racist campaign, despite his family specifically asking for his death not to be exploited by such groups. We’re working with and supporting local groups to organise a counter-demo, which the details of will be announced soon. The Facebook event is here. This is not the first time the EDL have set upon Colchester, in previous years the EDL “showed their respect” by Sieg-Heiling at a War Memorial. On their last visit, the EDL bused racists in from all over the country, only to be heckled and jeered by locals as the police marched them into the Castle Park and locked the gates. 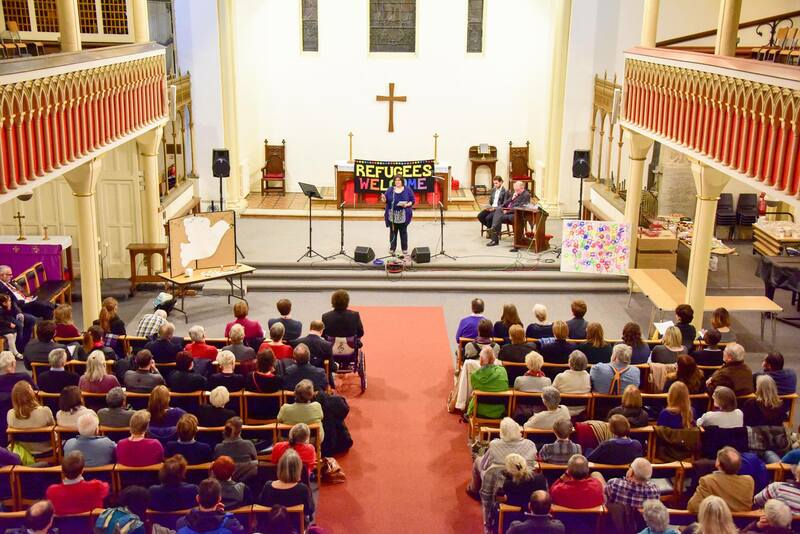 In November 2015, over 300 people marched through the streets of Colchester to welcome refugees. Colchester Refugee Action, Supporting Sisters + other groups have travelled to Calais multiple times to bring vital supplies to those in need. 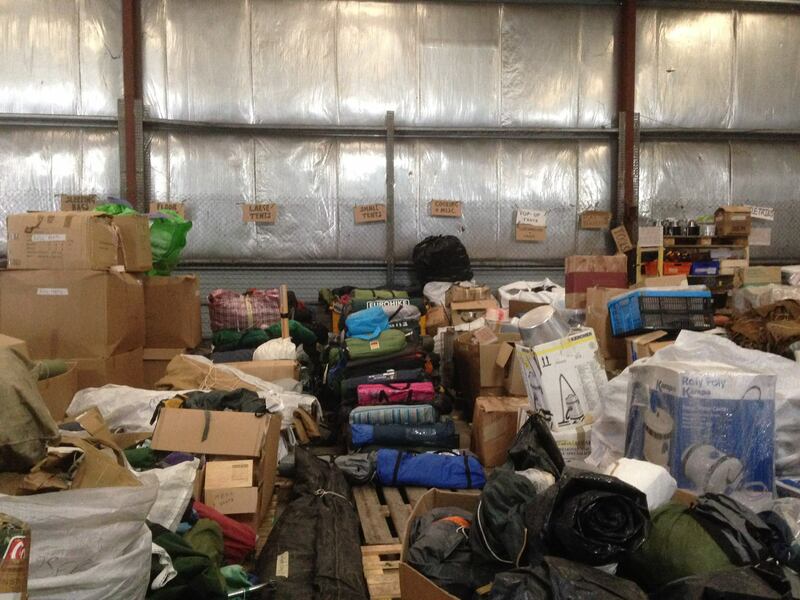 On their first trip donations delivered included 300 sleeping bags, 150 tents, 150 food bags, 400 wash bags, 200 coats and 200 pairs of waterproof shoes. 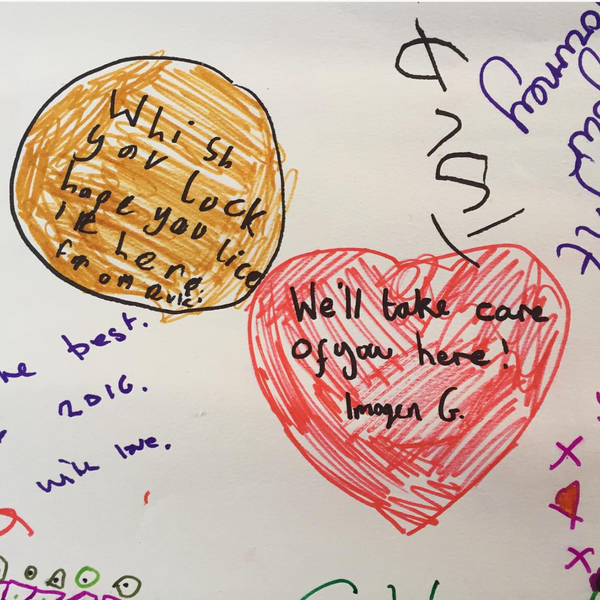 In December 2015 refugee families displaced by the Syrian civil war arrived in Colchester to start a new life. In January 2016, thanks to pressure from locals, Colchester Borough Council passed a motion to receive as many refugee families as need be. In March 2016 over 200 people attended a Pledge Assembly. Guests were encouraged to sign a pledge sheet with ideas such as driving a refugee to an appointment and teaching English lessons. That’s just a few highlights of what has been happening. Colchester has a proud history of supporting refugees and has strongly rejected the divisive politics of the EDL, and will once again. Join us and other groups on Sunday 22nd May. If you like what we do, get involved. 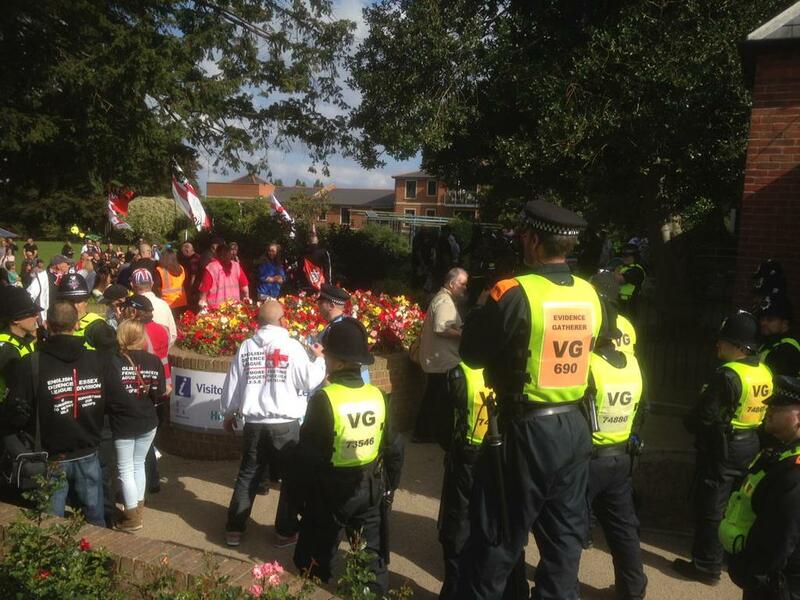 Successful community mobilisation against the EDL in Colchester! 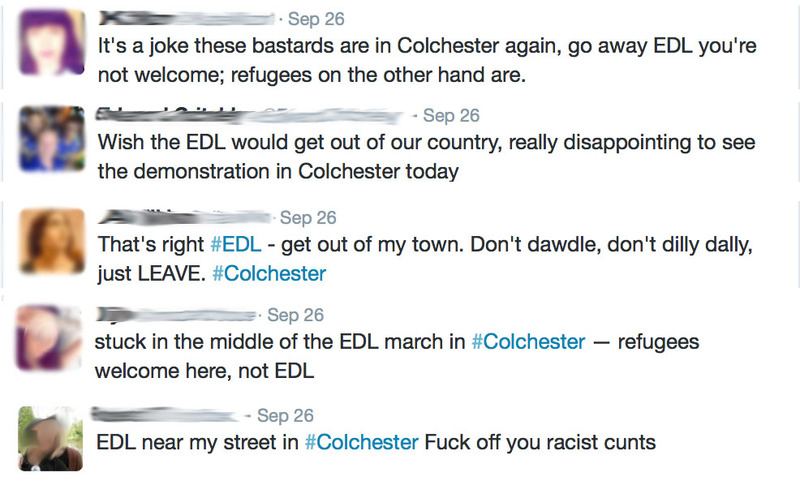 Report on the EDL’s visit to Colchester yesterday. After months of planning, the EDL’s “mighty return” to Colchester only managed to attract 80-90 racists, most of whom were bused in from all parts of the country. Groups travelled from Grimsby, Midlands, Yorkshire, London, Kent, Hereford and even Holland but they still could barely match our numbers. This in itself was a great victory, the racists had to be brought in from all parts of the country to bulk up their numbers but once again, locals were out in force, showing that racism and fascism won’t be tolerated here or anywhere. The day started with anti-fascists gathering outside the town hall at 11:30am. Prior to the demo, EDL members had promised “pay back” and “revenge”, suggesting they would “smash” anyone who got in the way. This didn’t really manifest – a few racists decided to walk up to our meet-point but hurriedly rushed to the nearest police officer when anti-fascists followed them down the street. At midday, while chants of “migrants in, racists out” echoed around the high street, the EDL began to march from their muster point and the public were loving it..
After being laughed and jeered at for a majority of their route, the racists finally made it to the high street where they were greeted strongly by anti-fascists who were pushed back and contained by police. After a few minutes of chaos, the racists decided it would be best to move on to Castle Park. Anti-fascists followed in an impromptu march which was greeted by cheers from the public, seemingly glad to see opposition to the monstrosity that had passed a few minutes before. As we got closer to the park, the gates were quickly locked by police meaning the English Defence League’s “mighty” demo finished with 80 bemused racists locked in a park, trying to get each other nicked. Racists end their demo locked in a park. 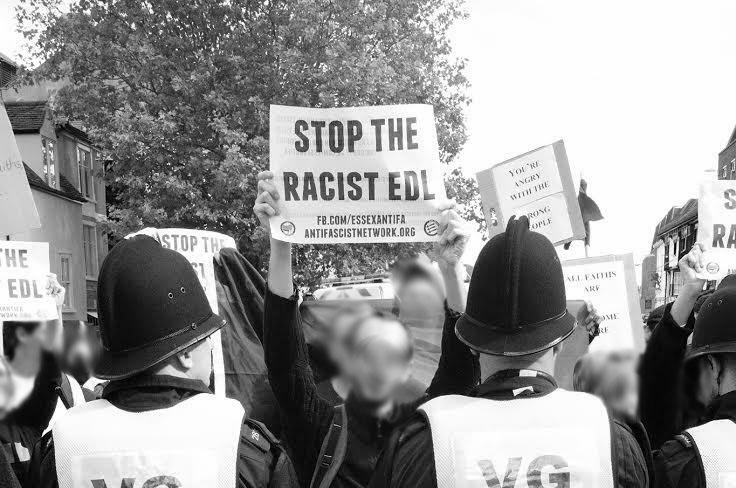 We would like to thank everyone who attended our demo yesterday, as a supporter said to us on the day, “it is because of people like you that this evil is not flourishing here.” The EDL have been targeting Colchester for over 4 years and we’ve successfully told them where the go every single time – we refuse to let their hate divide our community. Now is a great time to get involved with Essex Anti-fascists, please email essexantifa@riseup.net to do so. 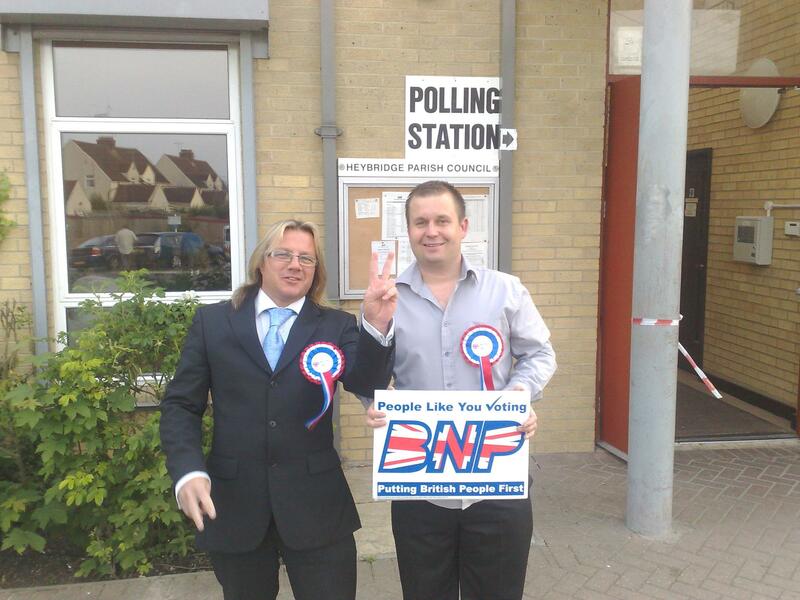 If you’re not based in Essex, get in touch with your nearest AFN group. 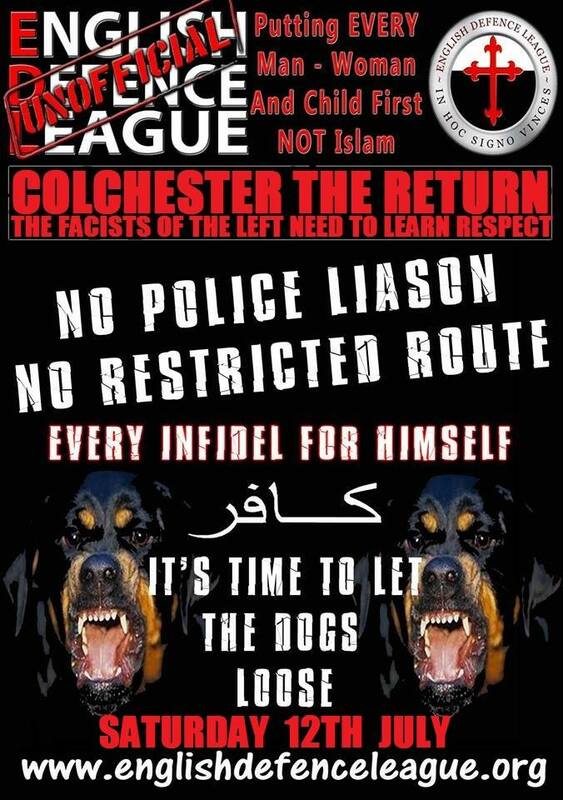 The racist English Defence League (EDL) are coming back to Colchester. We are organising a community resistance to stop them, join us! 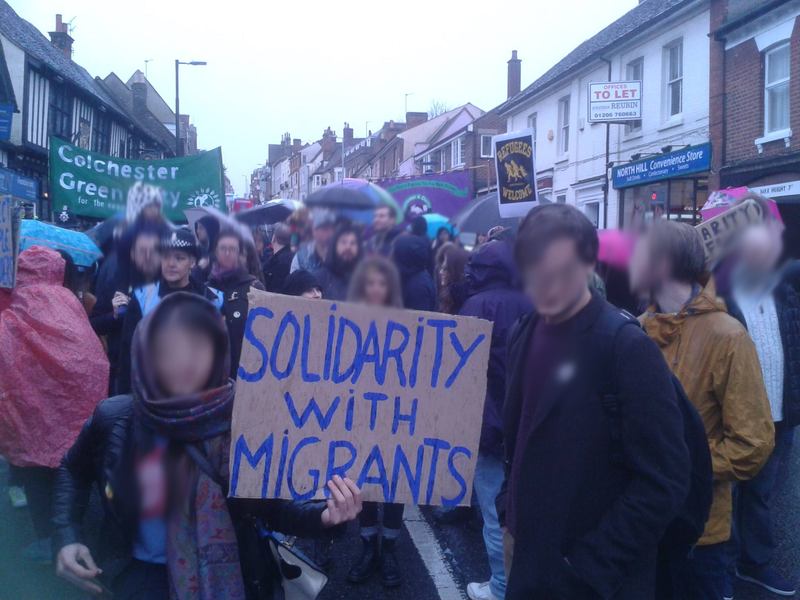 Called by Essex Anti-fascists and supported by the Anti-Fascist Network (AFN). The Mill House Hotel in Langford, Maldon might seem like a lovely place to spend the night but there’s something the swanky website is not telling you… The hotel is owned by Richard Perry, a leading member of the British National Party. 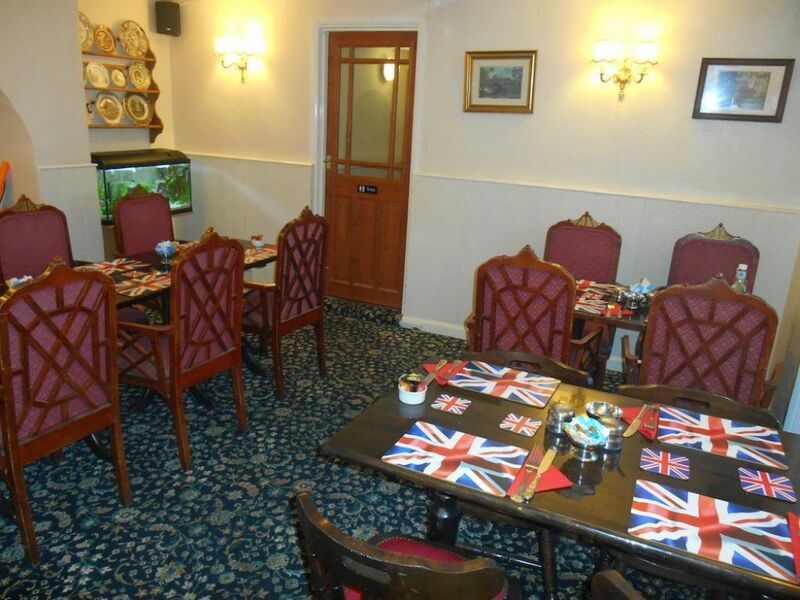 Richard Perry holds a seat on Parish Council and the Mill House is used as a base for local and national BNP meetings. It’s quite obvious that the hotel generates Perry a healthy living, he likes to brag about his two spanking new sports cars. Click here to let potential customers know about the hotel’s racist links by leaving a review on TripAdvisor. 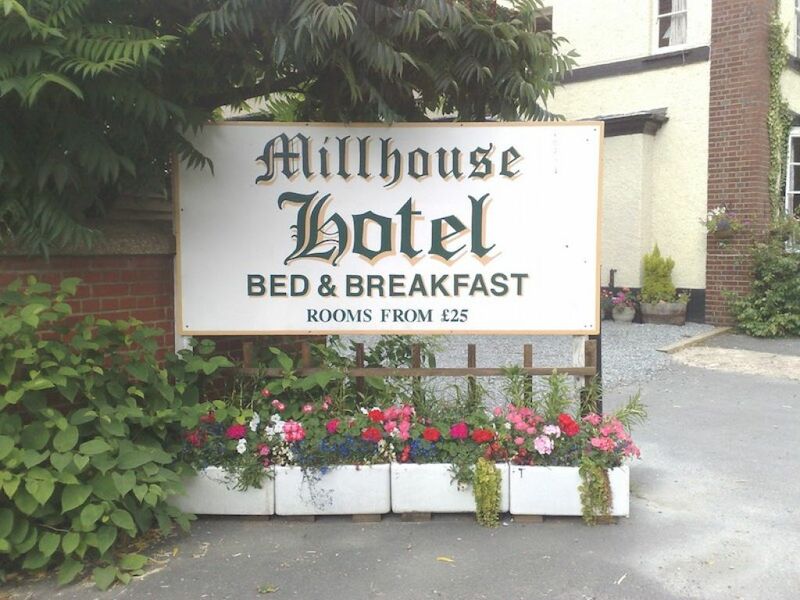 Click here to contact Visit Maldon and get the hotel removed from their ‘places to stay’ list. Click here to get in touch with the hotel directly. 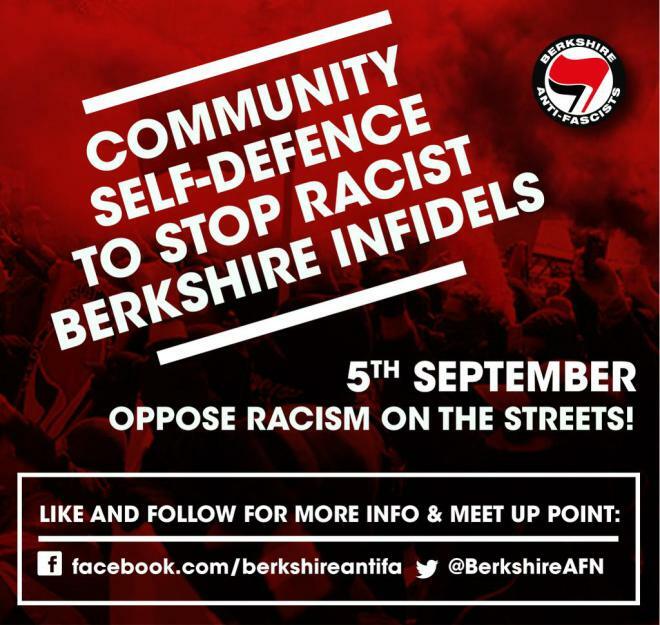 On the 29th of June the Essex ‘English Defence League’ will be in Chelmsford attempting to make their inherent racism and hatred somehow palatable by pretending that they only take issue with ‘radical Islam’ through the exploitation of a child abuse case to promote their hateful agenda. – We live in a patriarchal society in which sexual abuse is rife amongst people of all backgrounds. Male power and male sexuality in our society are deeply problematic. – We live in a racist society in which people who are not white are not seen as individuals but are held to be collectively responsible for the actions of their ‘community’. – We stand against all injustice and all oppression based on class, race or gender. – The EDL are trying to force this to become an issue based solely on race and religion whilst vulnerable children continue to be exploited and harmed ignoring the lives and experience of survivors of abuse. This kind of exploitation of abuse as an excuse to incite racial and religious hatred further proves their agenda. The EDL has constantly been proven to be run by extremely racist and violent thugs; making no attempt whatsoever to help and support survivors. As the EDL prepare for another racist rally no comfort will be brought to survivors and no justice will be served against the perpetrators. The EDL will allow this to become a racial issue, whilst children continue to be exploited and harmed. If their concern for victims of child abuse was genuine, why not march against the systematic abuse perpetrated by the clergy, especially that of the Catholic church? Why have they not campaigned for the release of the “lost” Whitehall files relating to abuse and cover-ups at the heart of the British government? The abuse by white celebrities? Or even their own members? We stand against: patriarchy, against all abuse, against fascism/racism and the marginalisation of women and the working class. We will not succumb to bigoted, dangerous and hateful hijacking of the experience of survivors of abuse. 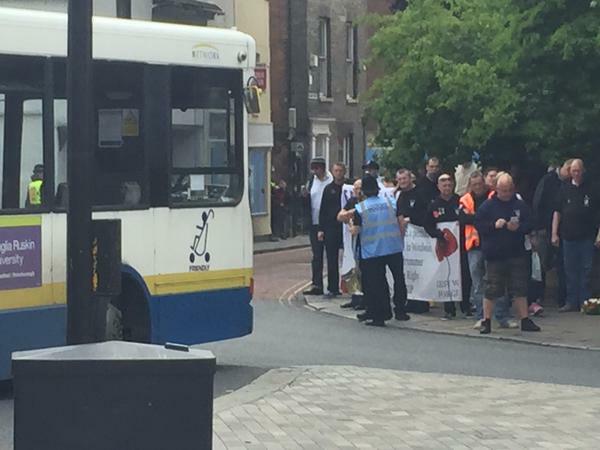 The English Defence League (EDL) returned to Colchester last Friday and once again they were heavily outnumbered by anti-fascists with their route blocked for a number of hours. Anti-fascists had an early start at 10am and successfully blocked the EDL’s route till gone 1pm, until the maxim that there is no such thing as a fascist march only a police march rang true with the police protecting the fascists, threatening arrests, kettling and striking anti-fascists, and even going as far as sickingly assaulting a disabled women in order to clear a way for EDL’s disgusting attempt of turning Lee Rigby into a far-right martyr against his family’s wishes. Only around 20 EDL members were in Colchester on the day and even that was with the busing in of far-right activists from as far as Dover and Kent for this ‘regional’ march. Around 60 anti-fascists assembled early in the morning and successfully obstructed their rally. One anti-fascist was arrested during the standoff but was released without charge later that night, greeted by anti-fascists who had been waiting outside the police station. EDL huddle on a street corner heavily outnumbered for a third time. This is now the third time EDL have tried to march in Colchester using Lee Rigby’s tragic death to further their racist campaign, despite his family specifically asking for his death not to be exploited by such groups. This was not about “respect”, this was about racists exploiting any opportunity to further their sickening cause. Far-right groups should not be tolerated demonstrating in any place, no matter what their excuse. The EDL were supposedly commemorating the anniversary of the death of Lee Rigby by laying a wreath at the war memorial and yet again still couldn’t stop themselves pulling Nazi seig-heils, and this is not the first time in Colchester this has been witnessed. Click here to see the video. EDL Essex Regional leader Mark Dunbar agrees with Lee Coplen that nothing shows respect like a Nazi salute in front of a war memorial. Every-time the EDL have attempted to march in Colchester they have been heavily outnumbered. 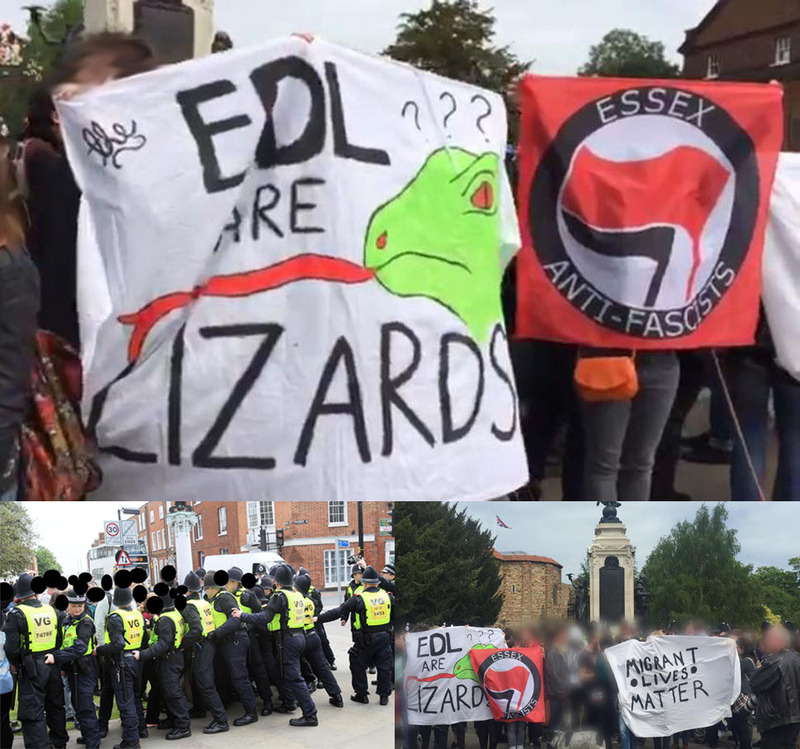 It is clear that EDL are incapable of getting a foothold in Colchester and their numbers have ebbed each year – let’s hope they don’t come back next time. Colchester has strongly rejected their racist politics, even the local pubs will no longer accept them after antifascist pressure. Clearly they cannot go where they want in Colchester. EDL’s Clacton division leader Herbie seems upset. 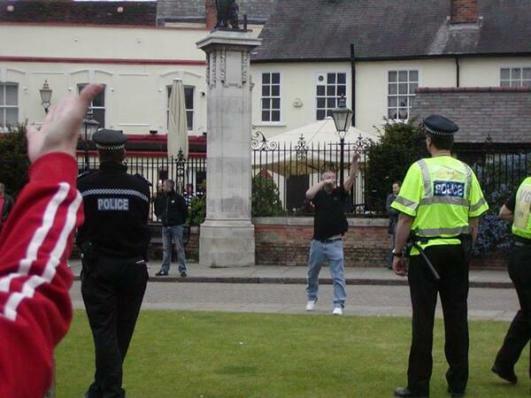 In 2013 EDL spent a number of hours chanting and doing Nazi salutes at Colchester’s war memorial leading to one EDL member, Kevin Reed, getting locked up for making Nazi salutes and using racist language. 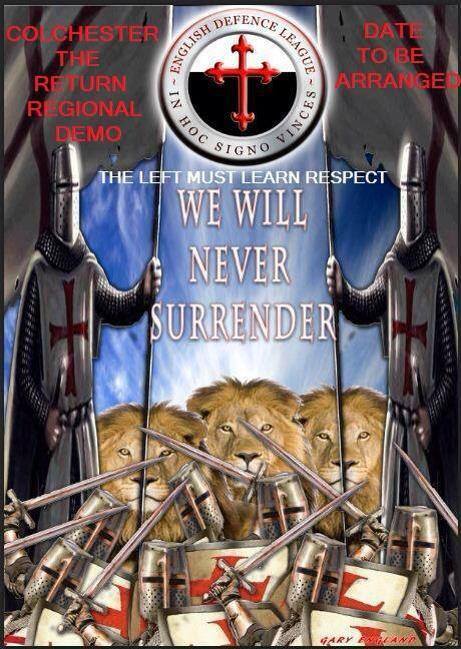 In 2014 EDL were again outnumbered around 3-1 and quickly scuttled off. After this humiliation they threatened to come back to ‘teach the left a lesson’, However, they didn’t find the courage to turn up and quickly cancelled their demo, postponing their ‘mighty return’ until last Friday. Although the racists had promised to ‘let the dogs loose’, they once again found themselves outnumbered, forced to spend 3 hours huddled on a street corner while the police did their dirty work. Overall we believe it was a positive day minus the police violence and arrest. A large militant group was mobilised that successfully obstructed and disrupted the EDL’s rally for a number of hours.